We received the first data from LYRA and SWAP! Find all images and movies here. - Following the partial solar eclipse in March and the Mercury transit in May, there is one more celestial event in the making this year. On September 1, an annular solar eclipse will take place as the orbit of the Moon takes it once more in front of the solar disk. Because this orbit is not a perfect circle, the apparent diameter of the Moon as we observe it in the sky changes while the Moon travels along its orbit. Depending on the point in the orbit at which the eclipse takes place, the Moon is therefore not always big enough to cover the complete solar disk. A ring (or annulus) of sunlight then remains visible around the Moon and the eclipse is called an annular eclipse. In just a few days, on September 1, lucky observers along the eclipse path in Africa and Madagascar will be able to witness an annular eclipse. From many other locations in Africa, Madagascar and India that are not in the central shadow region, this event will be observed as a partial eclipse where only part of the solar disk is covered. Seen from Earth, the eclipse will start at 07:13 UT, reach its maximum at 09:05 UT and end at 10:58 UT. Also ESA's PROBA2 satellite, which orbits the Earth at an approximate height of 700 km, will view this eclipse as partial due to its different vantage point. In fact, because the satellite only takes about 90 minutes to orbit the Earth, it will pass through the Moon’s shadow several times during the event and so PROBA2 will not observe just one, but as much as 4 partial eclipses! 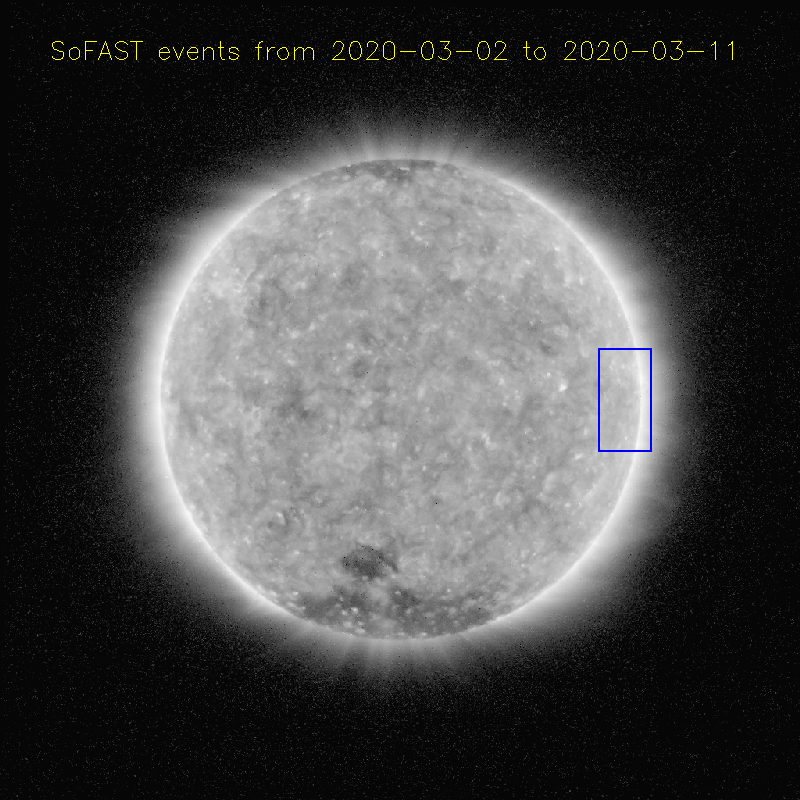 In addition to that, the Moon will appear 2 times in the field of view of SWAP, the EUV imager onboard the satellite, without touching the solar disk. This is illustrated in the simulation below. Movie 1. 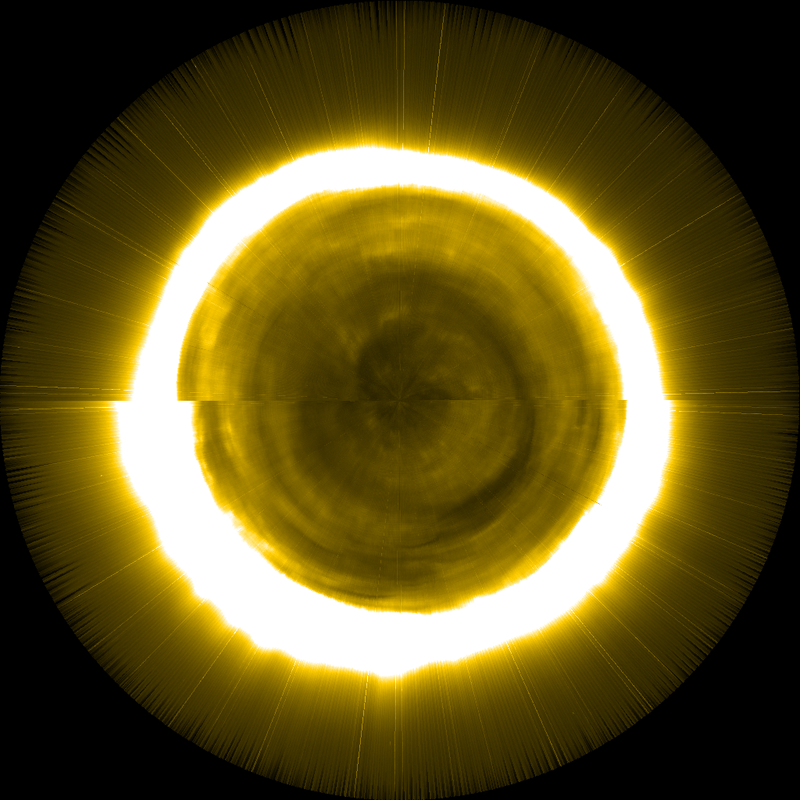 Simulation of the partial eclipses viewed by SWAP. 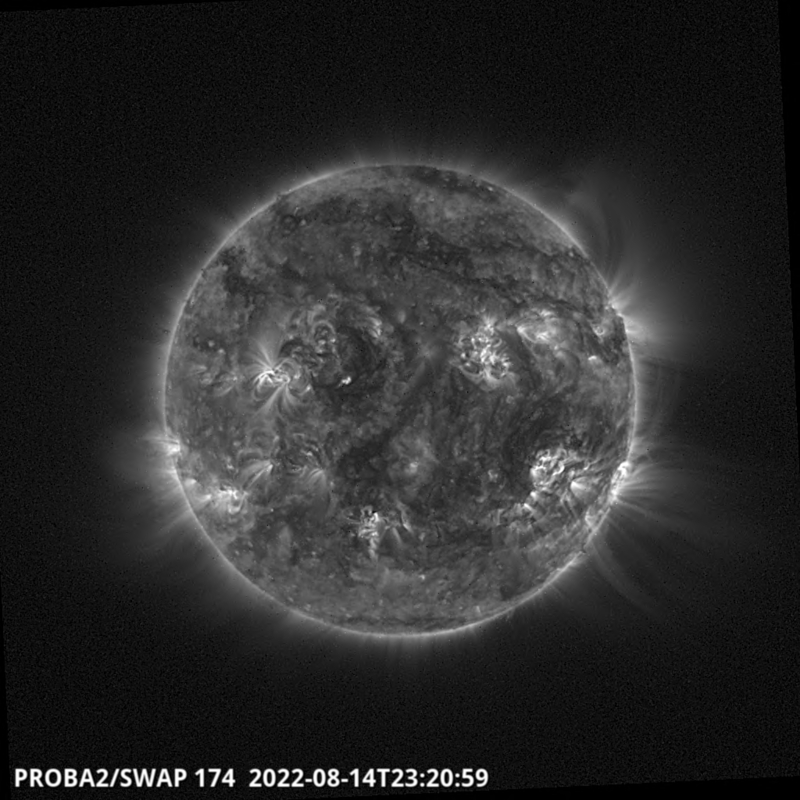 We will closely be observing the Sun with PROBA2 on September 1. In addition to taking images with SWAP, we will study our star with the LYRA radiometer to measure the solar irradiance. As the simulation shows, the Moon will only block part of the solar radiation, which we expect to see as a dip in the LYRA measurements. 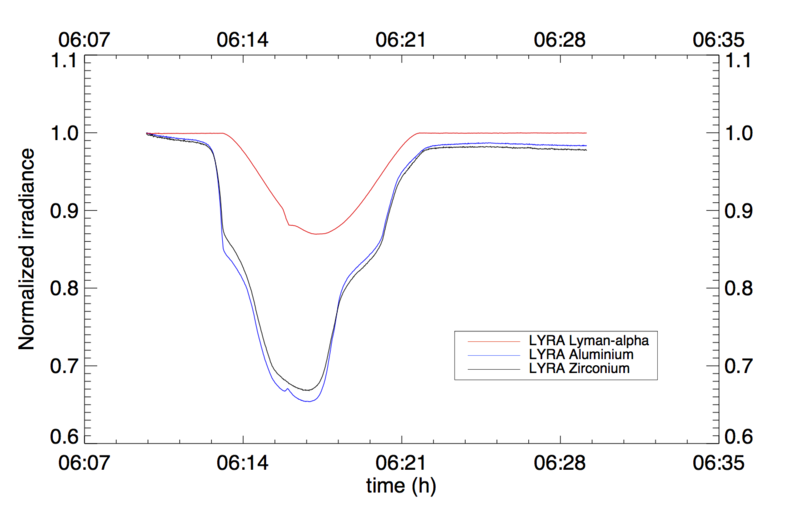 Observations from both the SWAP and LYRA instruments will be posted on this page as soon as they become available. SWAP observations (and the simulation shown above) can be downloaded from this directory. Update: the first eclipse observations have been beamed down by the satellite this morning. The first passage of the Moon in SWAP's field is shown in the image below. We eagerly await the next contacts with the satellite to receive more data. New images and updated movies will be uploaded to the directory linked above as soon as they become available. Viewers with a keen eye for detail may notice some bright points and streaks in the SWAP images and movies, suggesting the impact of high-energetic particles on our detector. These may be linked to the geomagnetic storm that occurred today, which was likely the result of a coronal hole on the Sun that sent high-velocity solar wind our way. Such active space weather can indeed disturb satellite observations, but fortunely rarely causes permanent damage to the instruments. Figure 1. Early this morning, the Moon obscured the right edge of the solar disk. 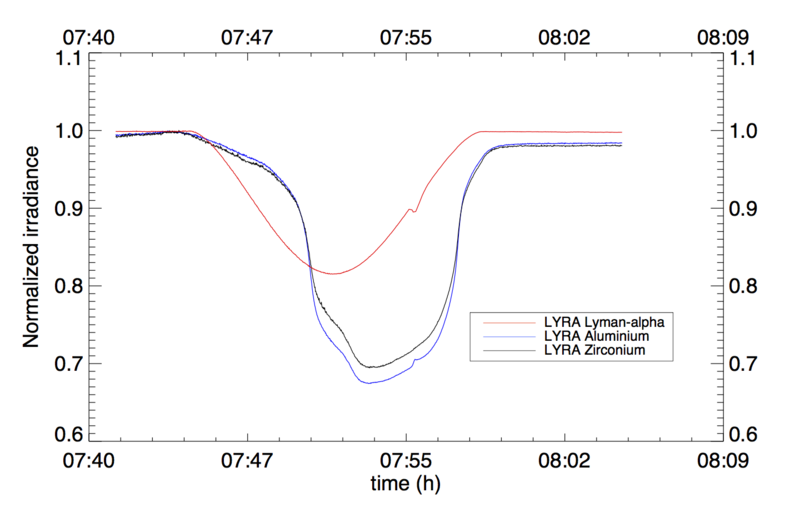 In LYRA's timeseries, the drop in sunlight intensity can appear either very smooth and regular, like in the so-called Lyman-Alpha channel, or more irregular as in the Aluminum and Zirconium channels. This is due to the difference in appearance of the Sun in the energy ranges observed by each of these channels. 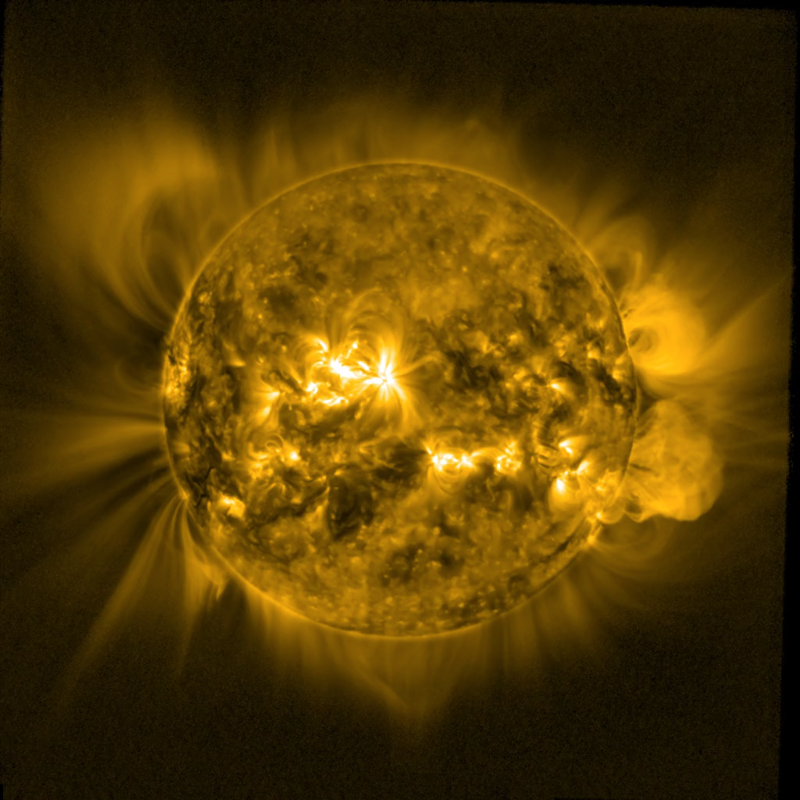 In Lyman alpha (ultraviolet), the Sun shows a more uniform aspect than in the other channels, which observe higher energies (extreme ultraviolet and soft X-rays). This is similar to the fact that in SWAP images (extreme ultraviolet) the Sun appears covered by bright and dark zones, which is very different from the uniform appearance it has in visible light (to which human eyes are sensitive). When the Moon hides one of these bright regions, this produces a stronger drop in the high-energy channels of LYRA than in Lyman-alpha. Figure 2. The drop of signal in three LYRA channels, during two of these hide-and-seek games that the Moon and Sun are playing today. The small perturbations at 06:16 and 06:40 are caused by maneuvers of the spacecraft. Eclipses are not only beautiful to observe (with appropriate protection! ), they are also interesting for solar research. Especially in the past, when satellite observations were not available, a solar eclipse was the only opportunity to directly observe the corona, the outer layer of the solar atmosphere. In normal circumstances, the corona is invisible from Earth because its light is completely drowned out by that of the solar disk. Now that we have several satellites continuously observing the Sun, we fortunately no longer have to await an eclipse to study the solar corona. Nevertheless, these events are still important, especially because they can spark some interest in solar science. In that respect, the total eclipse on 2017 August 21 that will be visible from North America will certainly be the highlight of the coming year!